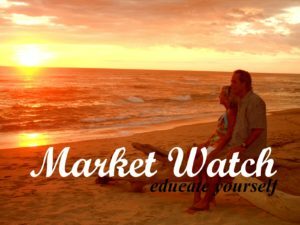 [En Español] The Farmer’s Market in Jaco Beach (Feria de Jaco) reflects a well established Costa Rica tradition which has been passed down from generation to generation. The country is known to be a tropical, self sustaining and healthy country that is rich in flora and fauna. But it is also recognized for the agriculture of organic fruits and vegetables. Every Friday from 6am to 2:30pm. Located next to the Garabito Clinic. Have you ever wanted to try and taste fruit and vegetables that are 100% natural, organic and free of pesticides. Then I recommend you come and visit Jaco’s Farmer’s Market also known locally as the “Feria”. The majority of the fruits and vegetables are grown relatively close to Jaco. The fruits come from a small town called Puriscal and the majority of the vegetables come from the province of Cartago. If you are a person who loves organic and natural fruit, you will enjoy the variety of delicious watermelons, papayas, pineapples and many more like the local favorite; mamon chino (rambutan) were originally found in Asia but are also grown here in Costa Rica. If you have never had a mamon then you’ll be in for a real treat. At the Feria de Jaco, not only will you find juicy fruits and vegetables. For example, the natural products offered by Peggy Chacon are made in Costa Rica. Peggy Chacon has to offer is a great example. Peggy has been coming to Jaco for over 5 years. 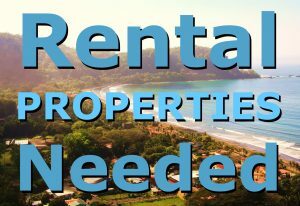 Every week she drives from a small town just outside of San Jose the capital of Costa Rica. 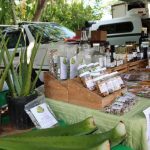 Some of the items she brings are her organic oils like coconut, moringa and rosemary along with her organic soaps and handmade chopping boards. Another great farmer who has been coming to Jaco’s Farmer’s Market for over 17 years is Minor Jimenez. He and his partner have a dairy company in Zarcero which is about 2 1/2 hours away. They make a variety of organic cheeses, like mozzarella, palmetto, queso fresco and queso seco. They also make some of the best sour cream. This is a white creme called Natilla which goes great with gallo pinto, a traditional breakfast dish of Costa Rica. So the next time you come to Costa Rica, make sure to visit the Feria de Jaco. 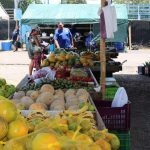 You will have the pleasure of interacting with the locals, getting that pura vida vibe, enjoying savory fruits and vegetables and supporting the local farmer.